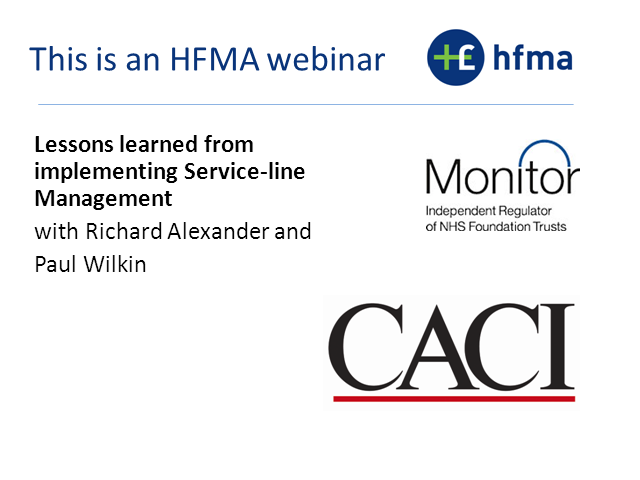 This joint HFMA/Monitor session will focus on lessons learned from two trusts who have been working within a Service Line Management structure for some time. The session will include short presentations from Richard Alexander, Director of Finance at University College London Hospitals NHS FT (acute) and Paul Wilkin, Executive Finance Director at Rotherham, Doncaster and South Humber NHS FT (mental health) and will cover what works, what doesn'ÃÂt and top tips for implementation. There will be time for delegates to ask questions and get immediate responses. Our Chair will be Kate Hall, Policy Adviser at Monitor.